So, I realise that 2012 is going to be the year in which lots of things happen. The London Olympics, the end of the world (if you believe the long-dead Mayans) and more importantly than that, my first trip to Rome. Did I mention that I’m going to Rome? I did? Sorry. I’ll stop. For a while, anyway. 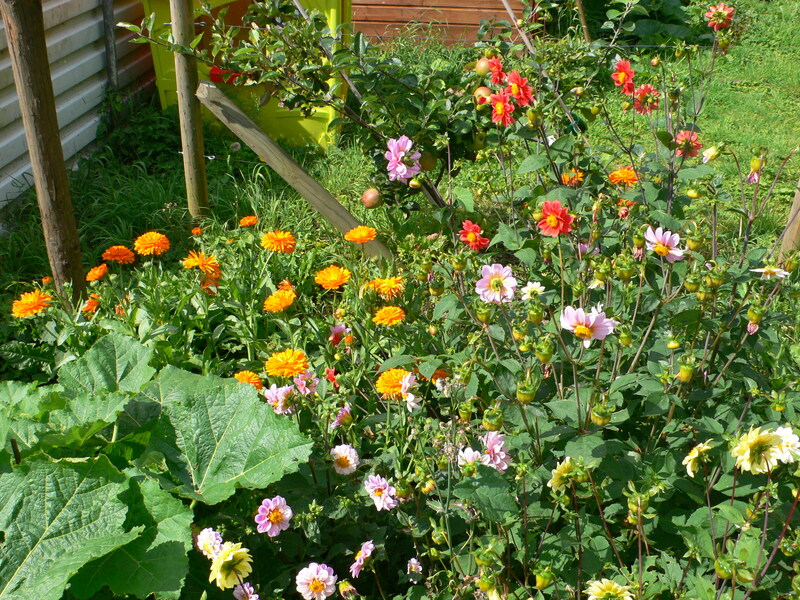 2012 is also the year in which I am going to plant more dahlias on the allotment. Lots and lots of dahlias. Which, incidentally, are pronounced like Roald Dahl, rather than ‘day-lia’ because they’re named after a Swedish botanist who also had the name Dahl. I still pronounce them ‘day-lia’ because that’s how my Grandma says it, and I know better than to argue with her. She is, after all, my dahlia inspiration. Every year, Grandma enters the local show with her flowers and every year she comes away with prizes. Given that she’s a superb knitter too, she’s like the family version of Kirstie Allsopp. This year, although I won’t be entering any shows, I want to be able to go to my allotment and pick great big dramatically bold and beautiful bunches of flowers for my house. The cutting bed last year. The lovely dahlias have suffered in the past for being exactly that – a bit too bold and bright, especially those with pompom or spider-like shapes too. Like 1980’s style, they went out of fashion when everyone suddenly decided that minimalism was chic and that bright and blowsy was just a bit common. However, those of us who like a bit of colour never wavered in our love for them. Now, thankfully, they’re back and in a big way. 10 Responses to The Year of the Dahlia. Oh I wish I hadn’t seen this… I feel a spending spree coming on! Oh I’m so like you I love dahlias too and grow them every year they are sold bold and beautiful. Will your granny give us any tips to growing ?? I’ll ask her for some tips! Do you grow from tubers or from seeds? I’m thinking of trying seeds this year, just because it’s so much cheaper. We raise ours from seed every year, usually dwarf varieties. Golden Acre Park in Leeds has an amazing dahlia garden. I now have green finger envy! Thank you! Although, it could go wrong yet, you know what they say about making plans!